Up to recent times, northern hemisphere populations could see ostriches in zoos, and study them in wonderment. Today, these flightless but extremely large birds are farmed in many cool and even cold climate countries for commercial purposes. There are even ostrich farms in Finland, not to speak of many in the USA and Canada. 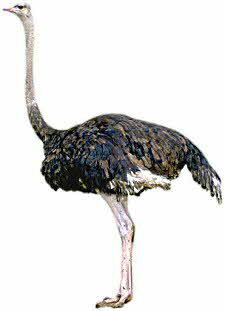 Ostrich wings are strong, and the bird uses them for ventilation when it gets hot. Cold whether induces them to adhere to the body tightly to create heat. Farm raised ostriches are fed with corn turkey and game meat. Although South Africans have been eating ostrich and using their eggs for centuries, in North America the bird has been on menus since early 1990’s with some success. The meat tastes similar to beef, but is somewhat tougher and dry. Leg meat is usually ground to break down tough muscles. Breasts are grilled, or pan-fried.